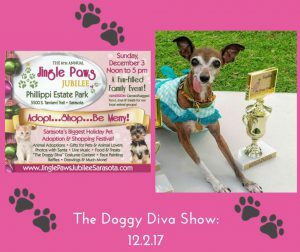 See you at Jingle Paws Jubilee on Sunday! Candace Botha – Founder of Suncoast Pet Magazine ‎shares the holiday issue and information about the community’s largest holiday pet adoption/shopping/ family fun event – Jingle Paws Jubilee – on Sunday December 3 from 12 – 5. Miss Olive is hosting the Costume Contest where you can win a trophy for “Best in Show” and more! For more information visit www.jinglepawsjubileesarasota.com.